Live at Ronnie Scott's /January 20,1990. 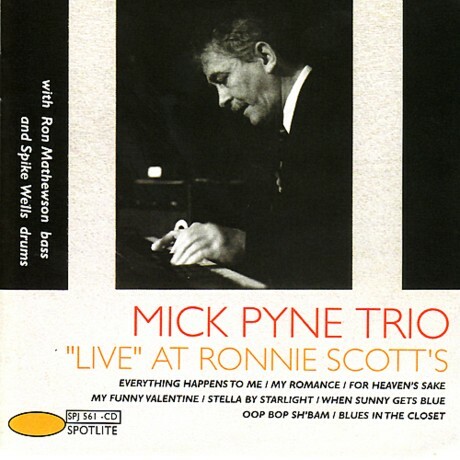 Pianist Mike Pine was born in Thornton Dale, Yorkshire in September 1940. He was the younger brother of trombonist Chris Pine and began to play the piano in early childhood. In his early teens he took a cornet, an instrument to which he returned later in his professional career. He was a talented multi-instrumentalist, and in the early 1960s he played with tenor saxophonist Ray Worley and Alexis Corner. He first came to London in 1962, playing solo piano at the Downbeat Club, and then joined the quintet Tony Kinsey in May of the same year, but soon returned to Yorkshire for eight months intensively practicing the piano. In 1963, he again came to London with Septet John Stevens, and then toured Europe with Stan Goetz, Hank Mobley Lee Konitz and others. Then he started working with Tubby Hayes, and by the end of 1966 was a permanent pianist Hayes. He made a number of excellent records with the Hayes quartet and a record made in early 1967 - Mexican Green - among the best achievements of Tubby Hayes, and the Pyne game is one of the factors contributing to his success. Since the late 1960s, Pyne has sometimes created his own bands, usually a trio consisting of bassist Hayes Ron Mathewson and drummer Spike Wells, as well as a quartet featuring Ray Warleigh and an octet that brought together a truly stellar cast including John Surman and Kenny Wheeler. With these compositions, Pine focused on his own compositions. He also played in Phil Simen's quartet in 1966, Ronnie Scott's Sextet in 1970 and Scott's Quintet in 1978. From the end of 1972 to the middle of 1985 he was with Band Humphrey Lyttelton. He was also a master of "walking" pianoforte. In the 1980s and 90s, he worked extensively and played in the United States, as well as in the UK. He died unexpectedly from an internal hemorrhage in May 1995.